I decided to be a nice boss and buy my team some Beard Papas. I bought a half dozen (3 regular and 3 chocolate) for ten dollars, and then cut them in half to serve at work. They were a big hit. 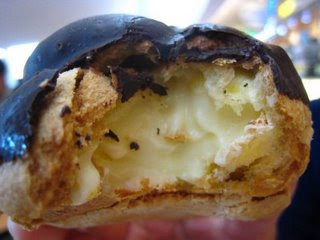 The second photo is of an eclair which I used in my previous Beard Papa post. 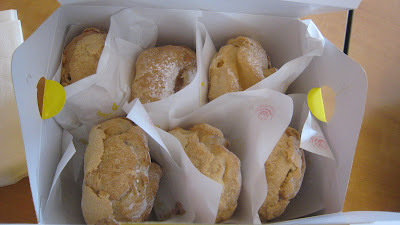 The best part of the Beard Papa cream puff is the cream that they use in them, cold but yet sooo tasty. After you order your cream puff at the counter, they are then and only then injected with cream, so the cream is really fresh. Regular flavour is much better than chocolate. If you haven't had one, go down to Denman and try one, only 200 calories. Not bad. The strawberry is fantastic when they have it. I love Beard Papas. Strawberry is good. Chocolate tastes like mousse or something. And then if you're lucky sometimes they have pumpkin, seasonal obviously. Does anyone know if green tea is good? I like tea and I like green tea ice cream but always just want the original when I go because the inside is like a non-brulee'd creme brulee. Mmmm tasty. OH MY GOD PAPA BEARD!!!!!!! My boyfriend is addicted to this stuff. It is crack for sweet addicts. He gained 15 lbs over the summer from these tasty creatures. The eclaires are the bomb!!! 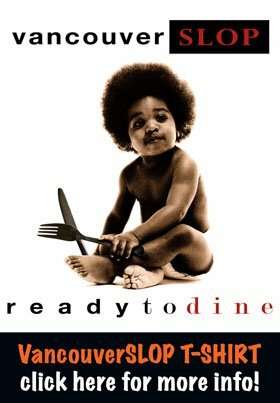 To die for!!!! !